A good blog needs a beautiful layout, otherwise all the contents are not valued… try to think if the iPhone had had a bad graphic, well, it would not become what it is! For this reason I believe that if you own a blog or a website, choosing the theme for your needs is one of the most important things! Today I present to you the Elegant Themes, professional themes for WordPress, often used by web designers for their projects, which is synonymous of quality and professionalism. I also have used them for some sites that I have developed. I immediately fell in love with these themes and now I can say with pleasure that I am a happy customer 100% satisfied. Design: looking impeccable and very attractive, definitely provides a professional look to the site. Price: the price is 39$ per year for about 76 professional themes! Simplicity: very easy to install (just like any other themes) and above all, they are very easy to customize for those who do not know anything about HTML! They also have all the basic functions, such as changing the background color, SEO, ads management, field to insert the Google Analytics code and many other features. Variety: there are themes for every need! For blog, company website, showcase to sell products, video games site and many others. Support: through tutorials and videos, supported by a forum and a lot of questions are already answered. 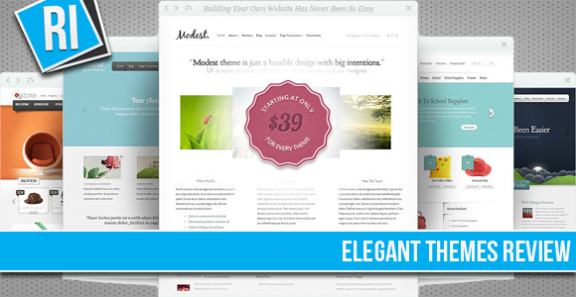 Elegant Themes is an American company owned by Nick Roach, an experienced developer of professional themes for WordPress. Currently, the site is one of the 1000 most visited in the world and over 143,500 people have decided to buy and use themes of Elegant Themes, numbers that are a guarantee! The work of Nick and his team is very detailed, precise, elegant and professional. Almost every month they publish two new themes, of course, readily available and free of charge to existing customers! The design is a strong attribute of Elegant Themes. Graphic very professional, clean, well-organized, in high resolution and with different color schemes for each theme. The contrast between the colors, allowing users to stay focused on the content, rather than elsewhere, which is what we all want. The graphic is particular, it isn’t the classic stripped graphic of a free theme. It is enriched with details that give a touch of originality. However, this is paid in terms of loading speed of the site, with a slight slowdown in the order of less than half a second. Nick is continuing to optimize the themes to limit (from my point of view, he has already succeeded) this little slowdown. The code is well written and it is easy to customize the CSS for those who know a little of this language. If you do not understand anything, you can do everything with simple buttons and clicks. The figure below shows the admin panel, more precisely, you can see how easy it is to specify which pages to show in the navigation menu (green tick) and which are not (red cross), simply by clicking on the icon next to the page name. The last themes are Responsive, which means that themes are flexible to fit the size of the screen where you see the site, such as smartphones (iPhone, Galaxy, etc. ), tablet and PCs, to allow to the user a better navigability. And all without having to install additional plugin as we did in the past. In addition, Nick is making responsive all the old themes, my compliments! Another point in favor of Elegant Themes is the price, an exclusive offer in the market of professional themes. At only $ 39 per year you will have access to all 76 + themes that are available! And the best part is that you can use them on as many sites as you want! This fabulous price, in all the other sites, let you to buy a single theme of medium / high level. Included in the $ 39 you will have free technical support on the theme and at all themes frequently updating… great deal, is not it? In addition, Elegant Themes offers the service money back guarantee within 30 days of purchase, so you can always try and see how you are. If you also want to have access to the PSD file of the themes, you can register as a developer at the price of $ 89 per year. A small investment which leads to a considerable saving of time in the process of realization of sites for the customers. PSD files are divided into levels, quality much appreciated by web designers! The “normal” users do not need this option. All the themes of Elegant Themes have a simplified management option, which allows anyone, and I mean anyone, even without any computer knowledge, to be able to change parts of the site to display and to change the color. 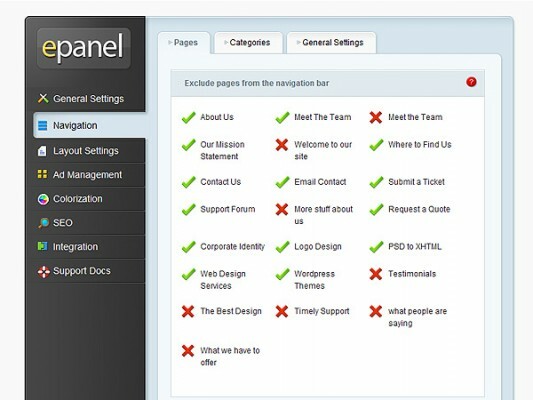 To do so, there is a special page called ePanel, which allows the management of the theme / site. Each theme has a column widget ready (of course you can customize it), and it has the ability of customize the thumbnails that are generated automatically, the thumbnails of the images that represent (usually) the post. This function is very convenient and useful, I assure you! There is also the integration of the gravatar, the profile pictures that appear in the comments and in the author box. 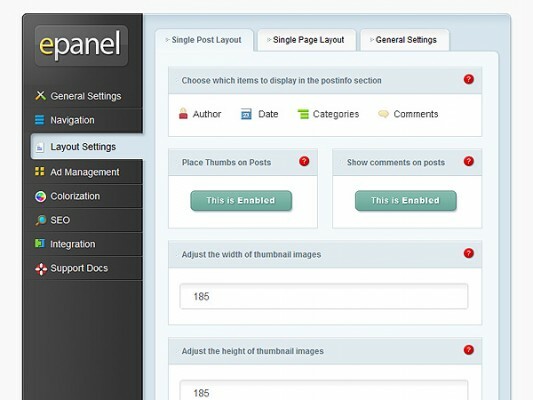 In many themes there is already a slider, or a box to scroll through the images attached to posts and / or pages, visually striking and highly customizable always through ePanel. The structure of the post can be easily customized by selecting whether to show the date, the author, the size of the image preview and other options (as you can see in the figure just above). There is also the insertion of advertisements directly into the site through ePanel, and a section for SEO optimization for search engines, so as to relieve the site from any additional plugins. The themes are available for the shortcodes posts and pages, which are used to show the colored boxes (box of attention, to download, to quote the text …), to insert the buttons of different color / icon and a tab container in which you can enter the text. There are also shortcodes to insert sliders, and buttons of social networks. One thing that I found very useful is that for every post / page, you can change the layout of those that are available by default. For example, you can turn a page on the contact page (with the form to send a message to an e-mail) by simply setting the contact layout of the page, without the need to add any plugin. Or for some issues it is possible to set the page layout to show only the image of each post, so you have a product showcase. It is also possible to have a portfolio page, useful to those who use the site as a showcase for their work. The support is good, there is a support forum dedicated to each theme (very comfortable then look for information on a specific theme), a FAQ (frequently asked questions) page and video tutorials. In my opinion, the support is more than adequate for the price you pay and it is efficient. The forum is run by Nick and his team of 8 developers. So compared to 143,500 customers, they are in a small number and can also answer in 24-48 hours. In my experience, I always received a response within 12 hours, but my questions were related to problems or explanations on the functioning of the theme. If you ask questions about how to change the theme to add features that differ from what Elegant Themes offers, of course, does not mean that they will respond, as it is not related to theme problems but to your own desire for omnipotence. In this case, you can still pay the developers to integrate your ideas into the theme, but I have never personally experienced. For each theme there is a FAQ section, with the most frequently asked questions. Often, it is enough to view this section to solve your problem, very useful. Usually, for classic requests, they give you the codes and they show you the exact location where codes will be inserted, so that even an inexperienced user will be able to make the desired changes. I don’t find any real problem. Given the professional look that gives the site, the facilitated management by ePanel and the really good price for the themes of this high level, I advise everyone to use themes of Elegant Themes, both personal and professional use, even for those who have no computer knowledge. For those who intend to use the professional themes on the websites of their customers, Elegant Themes is highly recommended because you can install these themes on an unlimited number of sites, with significant economic saving.